1I held the school record for the amount of yoghurt eaten at lunchtime from age 10 until I left at 13 – 11 bowls. The entire dining room watched as I repeatedly returned for ’seconds’ with the kitchen staff’s bemusement eventually turning into focused looks of challenge. I like to think that the deputy head opened a book on the final number and hope that Tom White, irreverent games teacher of the good kind, cleaned out his colleagues due to his faith in my eating ability and my ridiculously overactive fat child appetite. I suspect that in reality my showboating and eventual need of assistance to leave the dining hall were all beneath their notice and the adulation of my peers was all I got. I still like yoghurt. My coping strategy for institutional puck-textured fish cakes was copious butter and apricot-"flavoured" jam. I have to admit I'm a bit more classic with my fish finger sandwiches - mayonnaise and lettuce. Although I've been aware of your peculiar combination for a while I've never quite been able to bring myself to experiment, the disappointment of a wasted fish finger sandwich might be too much to stand if the combination didn't work for me. My ultimate comfort sandwich is a white bap with a chicken kiev in it. I don't really know why the creation of an oily, garlicy, slightly scalding mess is comforting, but it works for me. I grew up on sandwich spread sandwiches in my packed lunch every other day (cheese and pickle the alternative) and to this day I have no earthly idea what it was made of or what the lumpy bits in it were. I know I could look it up, but I think I'd rather not know. 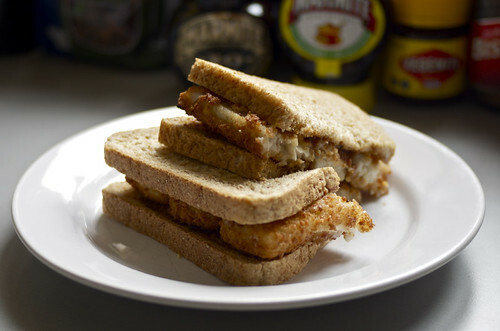 Could you make a toasted sandwich with a filling consisting of marmite, cheese and chopped fish fingers, I wonder? I wouldn't touch a fish finger with a ten mile pole but this post made me laugh a lot.